When Jeff shared he had met some nice folks who had an OwyheeStar named ‘Lu’ I thought who can it be beside you folks? Of course, we were not sure because you reside in Sisters, OR and have the coastal second home. Nevertheless, we realize people are mobile and explore other parts of the country. It was very fun to hear about the encounter and to see the two swimming in the beautiful North Idaho Lake. It has been a long time since I’ve written you, just been pretty busy with a blossoming fiber art-wear business and dealing with my 8-year old Golden Retriever’s (Shea) gum cancer. We did operate and they got all the cancer, according to follow-up tests; however, it came back and we had to say goodbye to her yesterday. 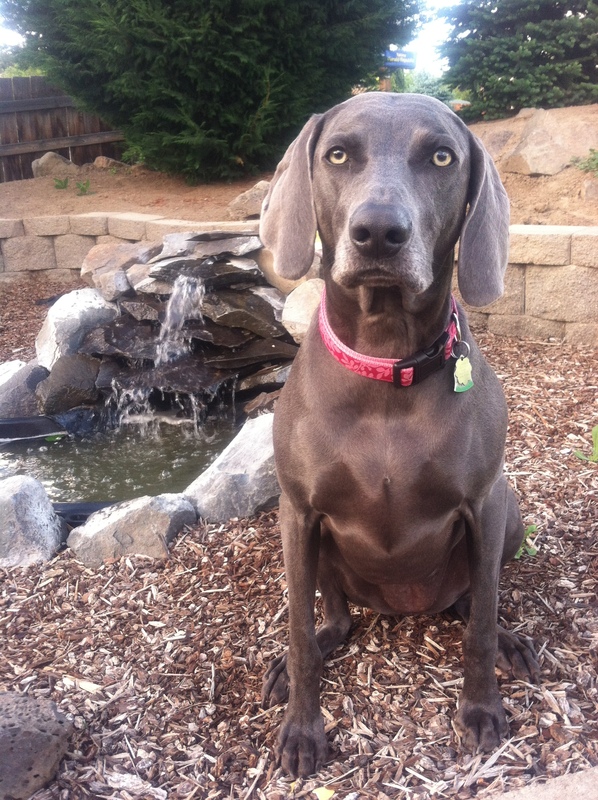 We are both heartbroken of course, and did shed some tears….tried not to get too emotional in front of Lu, our Weim, but of course she knows something is different. And it’s her birthday today, of all things (she’s now 6). At any rate, we are keeping her usual schedule and giving her good pets and exercise/ food etc., but she is clearly grieving the loss of her “sis”. Basically has retreated to her bed all day, not even going upstairs with Steve (her hero) when he goes to use the computer or watch sports. From what I’ve read, normal routines – exercise etc are the best thing for her (tho its still 16 degrees and freezing fog, plus 4′ of snow, most we’ve ever had! ), and she will get a Bully Stick tonight for her birthday….with me holding the other end, of course..
Do you have any other words of wisdom for our girl Lu? Thanks so much, and we think of you often and read your posts ever day. 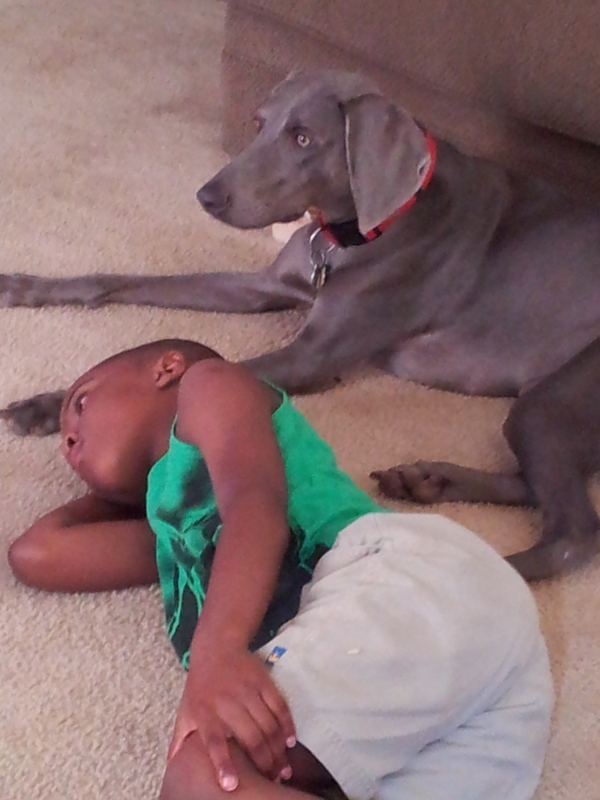 The grieving Weimaraner and how to help them face the loss of a family member is a tough question. No one grieves the same. I would say to not hide your grief and to just let the process unfold. Anyhow, tucking the struggle inside is not good for you. 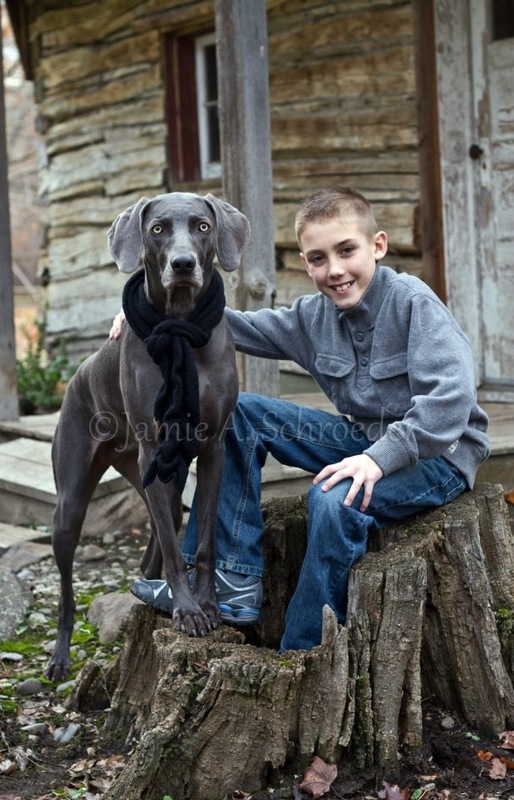 Nor, does it really hide that emotion from the very intuitive Weimaraner. I thought you might enjoy this piece I wrote about our now-5-year-old (can’t believe it!) Lu…..(True x Benton 2011) Pic attached – let me know if you have trouble opening it. P.S. Shela– we are still enjoying the blogs so much – thanks for all your hard work (Cliff’s too!). Lu is the perfect candidate on every level. Seriously, all others pale in comparison–she is a looker and knows how to have her way with you no matter your political persuasion. Feel free to repost. This would be fun to keep going. I have been looking for just the right dog, recently, since losing my best friend two years ago. I respect the time and effort you put into Luey’s breeding as well as shaping his world. Now that I live with Carmella and Martin, I am so lucky to take Luey running, hiking, to social events. Sometimes we just hang out – like this weekend when my brother in law finished the Leadville 50. The personality and composure of Luey cannot be matched. I cannot wait to hear from you! In the meantime, please enjoy these photos of Luey. Breeder’s Note; As you might guess, we receive a goodly number of inquiries that are a direct result of a loss. It is beyond sad to hear of such a loss; however, we know these precious creatures do not live long enough to suit our taste. Return clients, as well as referrals, make up a considerable percentage of our puppy placements. On more than one litter, fifty percent would fall into this category. We cannot thank you enough for sending good folks our direction. We do not take your vote of confidence lightly. We haven’t posted for quite a while, but wanted you to see our Lu “in flight” – caught by friend on camera’s sports-setting. Lu joined the family including a Golden Retriever female a little over a year older, and immediately established herself as Alpha Dog ! Two photos attached – one of the girls after breakfast waiting patiently on the couch for the morning runs to begin, one of Lu in the afternoon after a ball. We live most of the time in Sisters, OR and part-time at the Oregon coast (Florence) where both girls spent their puppy time. Our property is fully fenced, and at both locations we walk them (they run and retrieve) about 2 miles in the morning and another run/retrieve at night. Meantime, naps and investigation of wildlife smells, and endless teasing by squirrels at both “their homes”! Lu is an amazing athlete, and this pic shows her at the height of flight, trying to snag a ball, which actually bounced off her nose and she had to make another run for it. The fence behind her is 6′ tall – and she looks like she is standing on it! Many good healing thoughts to you, Shela, and hugs to Cliff as well. Sharyl, Steve, Shea and Lu. Breeder’s Note: It never ceases to amaze us when we consider the Weimar verbal skills. Their computer skills put ours to shame. I guess we were fortunate that Jacie’s Mom was so busy. Thank you Jacie for getting us this cute photo. We love knowing you are a happy girls. Sonia is just under 3 years old and amazing! It has been a while since we updated so I wanted to share with you this photo and let you know she is doing very well. We are still so grateful for her. We were concerned about her for a bit as she was acting lonely after Clifford (the adult Weim we had when she came home) died a few months ago, but she has pulled through it fine!